World Fishing Network’s 'Jimmy Houston Outdoors' Provides Heart-pounding Excitement on Wednesdays at 8:30 p.m.
Jimmy Houston Outdoors on World Fishing Network on Wednesdays at 8:30 p.m.
Houston is someone who prides himself on his love of charity, as well as his love of fishing. He works with charities such as: St. Jude’s Children’s Hospital, Benefit 4 Kids, Make-A-Wish, Hunt of a Lifetime, Brass Ring Society and Veterans Homes in Sulphur and Ardmore, Oklahoma. He is one of the hardest working pros in the industry, but he specifically crafts his schedule around his participation in the annual FOCAS Kids Day event on Lake Tenkiller and the annual Christmas Party at the Cherokee County Nursing Center. Not only is he one of the most giving and charitable people in the industry, but he is also one of the top professional fishermen of all time. He has been inducted into the National Freshwater Fishing Hall of Fame, as well as the Professional Bass Fishing Hall of Fame. Jimmy Houston Outdoors keeps viewers entertained with fast-paced and hard-hitting action every Wednesday at 8:30 p.m. on World Fishing Network. 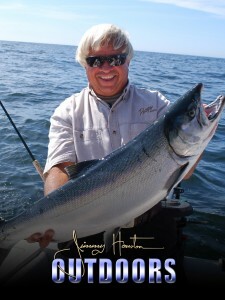 Jimmy Houston Outdoors airs on World Fishing Network on Wednesdays at 8:30 p.m.